Ever since I moved to Florida, I have been wanting to go to Puerto Rico because of its proximity and the low ticket prices. So for our one year wedding anniversary, I got us tickets to San Juan. I booked us a room at Casablanca Hotel mainly because we went to Morocco for our honeymoon. The hotel is beautiful and centrally located on Calle Fortaleza in Old San Juan. We rented a car for our trip and driving in San Juan was surprisingly calm and stress free. I was expecting it to be chaotic but it was not intimidating at all. We arrived at our hotel around 1pm but our room wasn’t going to be ready until 3pm. We left our bags with reception and headed to a local lunch spot for our first taste of Puerto Rican cuisine. Old San Juan is absolutely beautiful. I must have taken at least a dozen pictures during our two minute walk. The colorful houses and cobblestone streets transport you to another world. Speaking of cobblestones, if you stare down you will see blue and black stones. All the blue cobblestones are over 300 years old! The black ones are the modern replacements. Back to the food. We got some empanadas and mofongo, a plantain dish that can be stuffed with your choice of protein inside. I opted for chicken. It was delicious! 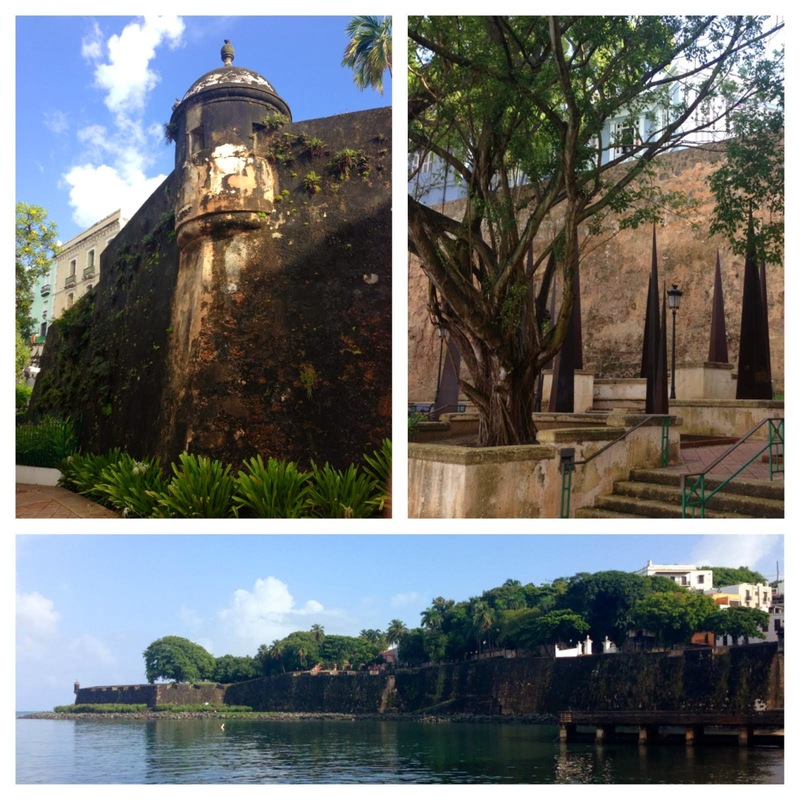 We headed back to the hotel via the scenic route and caught glimpses of the old fort and the sea. Once were were checked in and refreshed, we headed out for a long walk along the water. 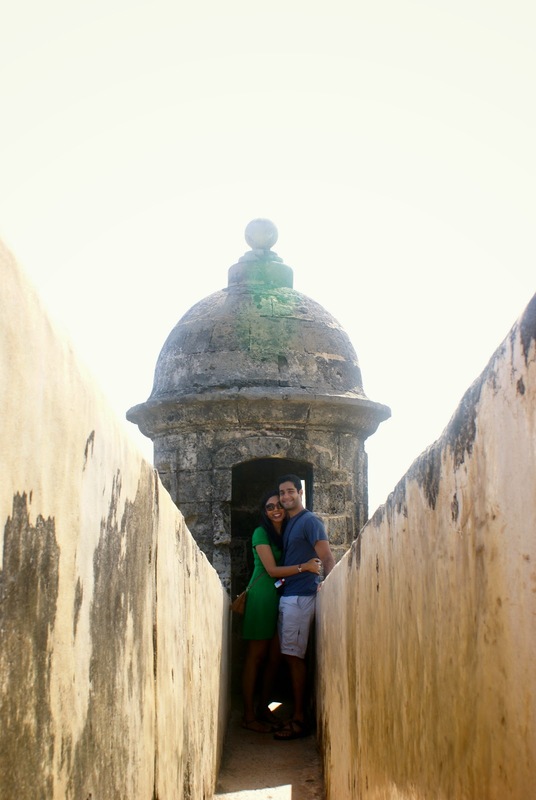 We explored Castillo de San Cristobal from the outside and made our way to Santa Maria Magdalena cemetery. The cemetery is nestled between a park, El Morro castle and the ocean and is such a peaceful place. We sat on one of the ledges for a few minutes to appreciate life and the beautiful sunset. Afterwards, we kept wandering through the streets and ended up at the only remaining gate of the city. There used to be six gates which were closed at sunset to protect the residents. We stopped here for an ice cream break and enjoyed the sound of the water. On our way back to the hotel we spotted a cute laid back pizza place our cousin had recommended. This quaint little restaurant is always busy so we put our name down. The meal was amazing and intimate. Great way to start an anniversary weekend! The next morning, we grabbed some quick breakfast and made our way to the fort. We arrived right when the doors were opening and essentially had the place to ourselves. It was the perfect time to explore. We weren’t the only ones trying to beat the crowds. As we approached the dungeon, we spotted a newly married couple taking some wedding shots. Their photographer even insisted on taking some photos for us! It was built in 1783 to protect San Juan from land attacks because the island was the first with water, shelter and supplies for ships en route to the Americas. After the fort, we got our car and headed to El Yunque. Since Puerto Rico is a US territory, our phones worked wonderfully for navigation. We arrived in around 45 minutes and took the El Yunque trail to the top. Unfortunately, there were a lot of clouds in the afternoon so we barely got to see the panoramic view. A lot of people head to Fajorado for food but we opted for Loiza because it was on the way back to San Juan. The town of Loiza was recommended to us by a local because it has an amazing street food scene and the arepas there are fantastic. 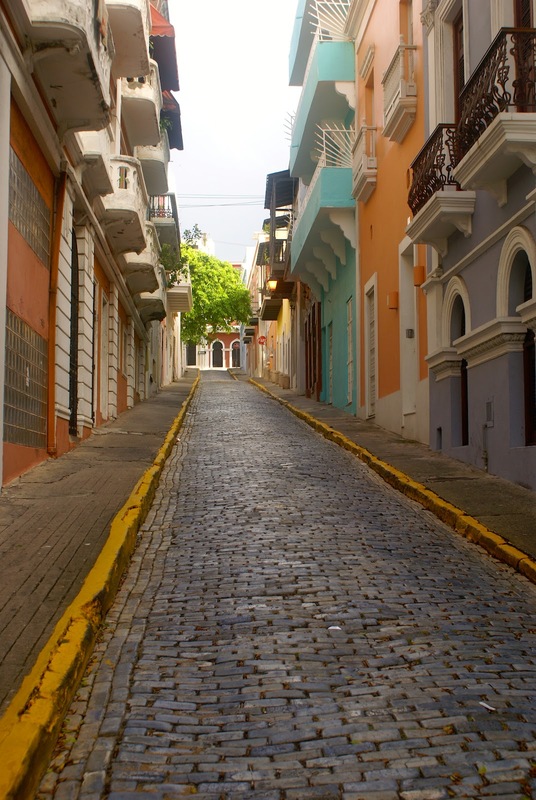 When we got back to Old San Juan, we noticed it was much busier from the day before. We learned this tends to happen when cruise ships dock. This has its pros and cons. Cons include busy streets, higher prices and a chaotic atmosphere. Pros include live entertainment and street fairs. We walked around and took in some of the live music but retreated fairly quickly to a nearby restaurant for dinner. This time we went with seafood at Tantra. The crowds made us rethink our plans for the next day. We changed our beach plans and decided to drive to Rincon and spend the day there. Rincon is on the west coast of Puerto Rico and has one of the best beaches and is a surfer town. We were told the drive would take 2 hours but it really took 3. Even though Steps beach was quiet and beautiful, we probably should have spent the day in San Juan because the drive was exhausting. We quickly forgot how tired we were in anticipation of our anniversary dinner. We made reservations at Marmalade and went with the tasting menu. The meal was out of this world! And the staff made the experience even better! They were very accommodating and made us feel very special on our anniversary. Our return flight wasn’t until 3 pm so we grabbed some breakfast and decided to check out some art galleries. By this time, the cruise ship had left so the town was quiet again. We decided to take advantage of this by walking along the city walls and taking in the views one last time before checking out of the hotel. On our drive back to the airport, we grabbed lunch at Casita Blanca, a hole in the wall frequented by locals. The neighborhood might be uncomfortable for some but we enjoyed the experience. We loved the feeling of being transported to another time.